One of my favourite platforms on the Net, Triberr, got into trouble during a routine database backup. And the community reacted in numbers.., and reacted supportively. Less than a month earlier we woke up to an unreachable Triberr. Due to various reasons the team had neglected to renew the domain name. 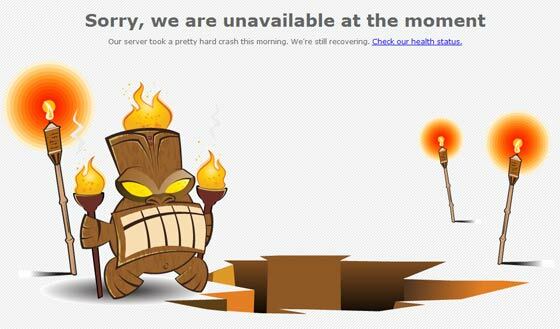 For more than 24 hours Triberr was unreachable and the plugin caused WordPress blogs to stop loading. Here some people reacted a bit crossed.., because, let’s face it, that was a mistake which could have easily been avoided. Dino apologised and explained in his own unique way. The 80+ comments reflected nothing but support. At first it seemed nothing more than regular maintenance.., a time was mentioned when everything ought to have been back to normal. At this point I must mention that Triberr is growing pretty big and pretty popular. Most of my content is shared via my Tribes (thanks tribe mates! ), my Tweetbot is awfully quite. It goes to show a lot of bloggers use Triberr on a daily basis. To read and share new content and to get their content out there. I must say.., we’ve grown quite depended on Triberr. It’s no fun when it’s not available. On the other hand, Triberr is still a nickel and dime start up. The site is run next to full-time jobs and without any venture capital backing it up. All costs are covered by Prime memberships. Yes, for some it’s a paid service which went off-line. The goodwill this creates obviously goes a long way and the sense of community is quite strong. This is, of course, at the core of Triberr.., and it shows. The regular maintenance corrupted the database, which had to be restored. One thing led to another and they had to build a new server and after restoring the database it turned out to be partially corrupted. Meaning more and more work. You can read about the details on the Triberr blog. This is a site on which people, at least I, depend a lot for getting content out there. I’m a Prime member, I pay for the service. The site is still down as I’m writing this, and for a second time too. Reason enough to be upset.., but we’re not. We are all in full support. The 65 odd comments on Dan’s post about the crash are all supportive. People offering support, virtual hugs and even help. The community build around Triberr is a positive one. The tribes are all about reciprocation and support. It’s about growing as a blogger and extending your community. Team Triberr have always supported and practised that philosophy. And when times get rough, we support, we do not burn. Here’s to you Triberr community.., I’m proud to be a part of you. You are welcome (and quick too). Rogier, I’m happy to be in the trenches with Triberr and people like you. I’m a prime member as well… frustrating – but more than anything else, Triberr is about people. Good people. You can build long term, long lasting value on that… and whether the storms when they come. Heads up Dino & Dan! Great article, Rogier! I think our only frustration with Triberr during this difficult time is being unable to help out Dino and Dan to take the pressure off of them. That’s exactly what surprised me, Carolyn. Beyond support.., it was the offerings of assistance. I was just thinking…what a great blog post it would be to point out the fact that we all have been there with tech issues and that this group of Triberr “fanatics” are here to support until things are functioning again. Rock on, dude! Cheers Kathi! It really is an experience… Something that needed to written down. Roger, Thanks for the update. I’m on Triberr withdrawal and am looking forward to the dust settling. Previous Previous post: The Social Media Paradox, will you break free?